Perennial herb famous because of the attraction cats have for the plant. The silver-green leaves and young shoots are also used as seasoning and a flavoring in tea. Attractive pale-pink or white flower-spikes attract birds and bees. 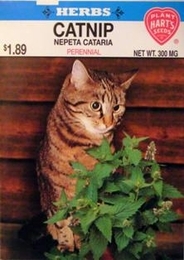 Catnip will grow without special attention. It is only necessary to keep down weeds in order to have them succeed for several years in the same location.